All The Words: What does 💲 - Heavy Dollar Sign Emoji mean? Cash rules everything around you? Get this emoji. 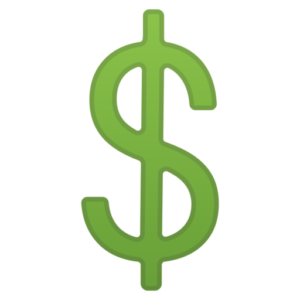 The heavy dollar sign emoji means money, mula, guap, cash, or dollar dollar bills y’all. It's #WorldTourismDay today! Studies show smoke-free restaurants bring in more 💲 & more satisfied customers. Support tobacco-free tourism! Of course we all know the heavy dollar sign emoji comes from the symbol meaning dollars, $. That symbol originally came from the abbreviation used for Spanish pesos in financial documents drawn up by English speakers doing business with Spanish-Americans in the 1770s. The emoji version of the symbol was approved by the Unicode Consortium in 2010, along with a slate of other money-related emoji such as the bank note with the dollar sign, the bank note with the euro sign, and yen with bank note. Everyone is familiar with this S with a line drawn straight down its center, though the color varies across platforms. It’s green in Google and Microsoft and gold in Samsung, but there is no mistaking this is the sign for cash money. The use of the heavy dollar sign is pretty much limited to people who like, have, need, or want money … so, everyone. It is often used in place of the word money to save the user time from typing out the whole word plus leaving more time to make dat money. I've decided to redecorate my room and spend 💲💲💲 on useless decor rather than spending it on food. Maybe that's one way to finally help me lose weight. You also might see it used in a teaser message from someone letting you know something lucrative is on the horizon for them, but they don’t want to say what yet. Let’s get this money is slang for “let’s get to work,” and so you’ll see the heavy dollar sign emoji in posts by people working hard to go after their dreams. To look on the money means to look HAWT, so the heavy dollar sign emoji is used express appreciation for beautiful bods. Finally, you’ll see it in posts announcing deals or job opportunities that may or may not be scams.